How to Find the Best Personal Injury Attorney Near Me? Home » Blog » How to Find the Best Personal Injury Attorney Near Me? Not all Personal Injury Attorneys are Created Equal. 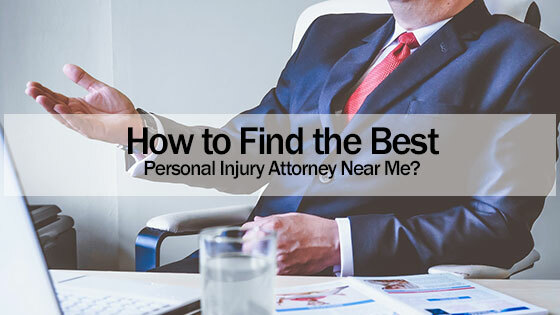 Many people are asking “How do I find the best personal injury attorney near me?” It can be difficult for you to find the right attorney. Every personal injury attorney is not the same, they may not have the same experience, knowledge, talent or support staff. Not all personal injury attorneys are created equal. However, if you know what to look for and where to look, then it will be easier for you to find the right one. You can start your search by asking your family members and friends for help. They may be able to tell you about personal injury attorneys who can help. They may also be able to tell you who you should avoid. Learning from people’s actual interaction and personal experience with an attorney is one of the best ways to know the type of attorney you may be hiring. You can find information about personal injury attorneys in your area by visiting state law websites and lawyer directory websites. These websites will be able to tell you if the attorney is licensed to practice law. They will also be able to tell you if any disciplinary action has been taken against them or if they are in good standing. Additionally, you can find where they studied law and their legal experience. You should make sure that your attorney has had experience working with your type of case. For example, if you are filing a slip and fall lawsuit, then you should choose an attorney who has had experience with those cases. You should also choose an attorney who has a good track record. If an attorney has a proven track record of winning cases, then chances are they are a strong personal injury attorney. If you have worked with other lawyers in the past, then you can use them as a resource for finding a good personal injury attorney. Attorneys often receive leads from other attorneys, so remember to not just take their word that they are a good personal injury attorney. You will still want to do your due diligence to make sure they aren’t just sending you to a referral partner with minimal experience. Online reviews are an amazing resource for seeing what previous clients have to say about an attorney and their law firm. You want to look at the number of reviews and also at the overall score. Not every client is going to be happy, typically because their case may not have turned out the way in which they were planning. However, if you look at the overall score you can get a good idea of the type of personal injury attorney you may be hiring. Your attorney should have experience. There is a difference between someone who has been practicing law for five years and someone who has just gotten started. Experienced personal injury attorneys know how to negotiate. They know when to take a case to court. They understand all the aspects of providing you a successful outcome for your personal injury case. In order for an attorney to successfully win a case, an attorney will need to have knowledge of the laws in the State, county and city. So hiring a local attorney is important because every place has different standards and laws. It is a good idea to meet with the attorney in person and discuss your case before you hire them. Therefore a finding a personal injury attorney near you is an important quality to look for. It can be difficult to go through any legal process. That is why you need an attorney who understands you and is willing to listen. You should have an attorney you feel comfortable talking to, and who can also explain the complexities of your case in an easily understandable manner. Communication is key and a good communicator knows how to listen. Our attorneys are here to help you. Contact one of our offices today so that you can get a free consultation.